Home / GST-Tally / TallyERP.9 Lessons / What is Manufacturing Journal & How to use It under GST? What is Manufacturing Journal & How to use It under GST? All these thing combine comes to make a product Pen. But supplier of each product is different and inventory of each product is different. For Example, You are purchasing 100 Nos. of each above item and sold 100 pens after join above 5 items each time. So your inventory will be 100 Nos. of Refill, Nib, Upper Cover, Lower Cover & Cap inward and 100 Nos. Pen outward. As a simple method, you are just pass inventory of 100 inward from Purchase and 100 outward from Sales voucher. But 100 Nos. of pens does not reduce your 5 items from stock list. So what to do now? You need to create Bills of Materials first for Primary Item PEN, Now you need to create a manufacturing Stock Journal. When you pass Manufacturing stock journal it will automatic reduce your inward quantity to 100 and make your stock NIL. Creating a new voucher type allows you to choose secondary option in Stock Journal. 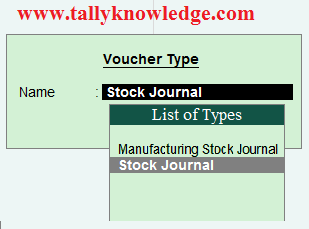 To Pass Stock Journal Voucher go to Inventory Voucher and Press Alt + F7, you will see there is two option for stock journal, 1 for Stock Journal and 2nd for Manufacturing Stock Journal.